My burpee pepper. It has 5 small peppers on it. 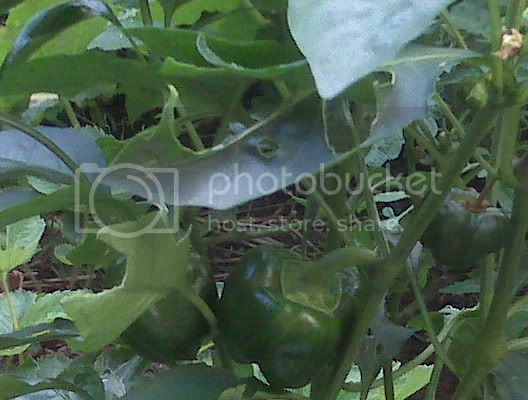 This shows the slug damage to a pepper plant and one that recovered. This is my jalapeno. It too was damaged but recovered. 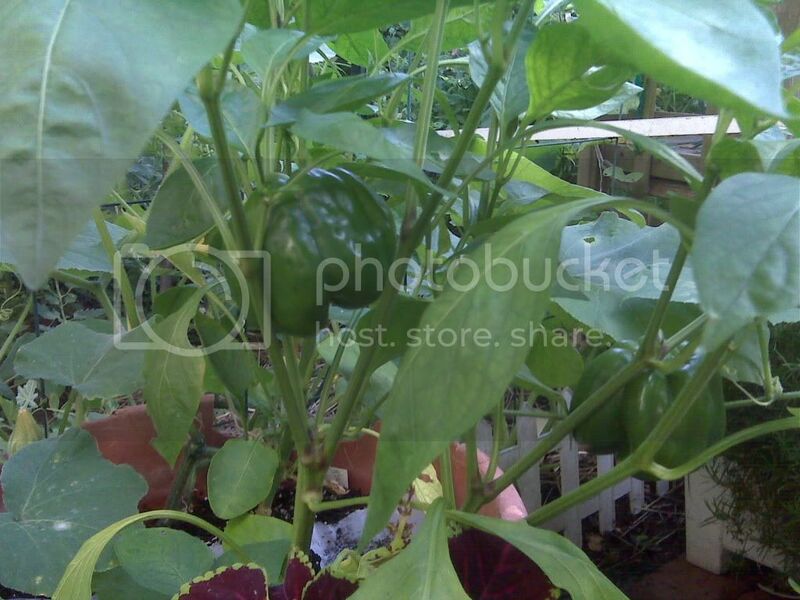 This is two pepper plants in a pot. The squash plant volunteered here also. Great peppers. You did a fantastic job. I have a terrible time getting them to grow. Great job with the peppers! I love using FRESH bell peppers when I cook fahitas! Yum... now you have made me hungry! I have always had trouble growing them too. I learned here at this forum to give them an epsom salt shower when the leaves got light green. I did that once. I also gave them acid fertilizer once to green up the leaves. Another thing I did was to deep water them. My clay soil stays wet so I was always too careful about watering. Great job with the peppers! I love using FRESH bell peppers when I cook fahitas. Thank you for this. Get Latest Articles on sunglasses. Thanks and you're welcome. I'm happy I finally grew some. Five of the damaged pepper plants have doubled in size and have blossoms and the start of a tiny pepper. This happened in one week! My son's puppy chomped one plant in half and ran with it. Thank you Tammy. Yes, most did. And the puppy. There is always something trying to eat our plants! I tried the epsom salt shower. Now all of the leaves are yellow and hanging sadly. Those are looking great. I might have to try some next year. Not a big fan of bell peppers at least that is from my childhood hatred of them. Dogs can do more damage than all the bugs and rabitts and disease put together. I said before if I didn't have a fence she would use each plant stepping stone style. I'm not kidding, she got in the other day and ripped out a broccoli (big footprint in it's place) and there are soda can size footprints at the base of 2 cauliflower, like directly next to the stem. Stupid dogs. Beautiful peppers Diane. I don't know why, but I think the pepper plants with peppers on them are the most attractive plants in a garden. Mine had a rough start with two late frosts which almost killed them. They certainly looked dead with all the leaves laying on the ground. They surprised me and grew great until the summer heat arrived. Now they look good again with the cooler, longer nights starting. tedln wrote: They surprised me and grew great until the summer heat arrived. Now they look good again with the cooler, longer nights starting. Funny you mention that Ted. My orange bell and jalapeno plants did the same thing. I have had blossom drop all year, because of the heat I assume. 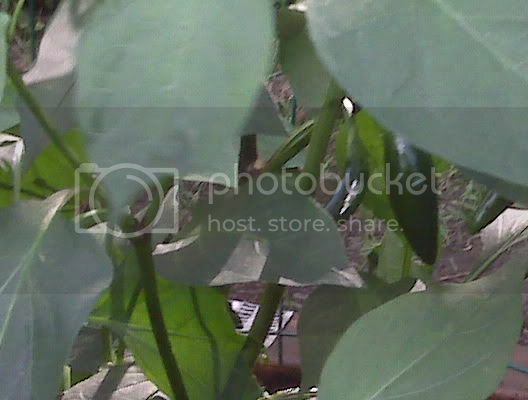 This morning I saw two jalapeno's growing. The orange bell has some new buds that look like they might make it as well. Fingers crossed. Your bell peppers look great! Thanks! My plants are now heavy with blooms as they were in the early spring. Since they are now 36" tall instead of 18" in the spring, I guess I am looking at a huge bell pepper crop this fall. My jalapenos and other peppers are doing well. My eggplant didn't start producing until the temps were well over 90 degrees. Now they are so heavy, they are bending to the ground. I suppose they will stop when the cool weather starts. 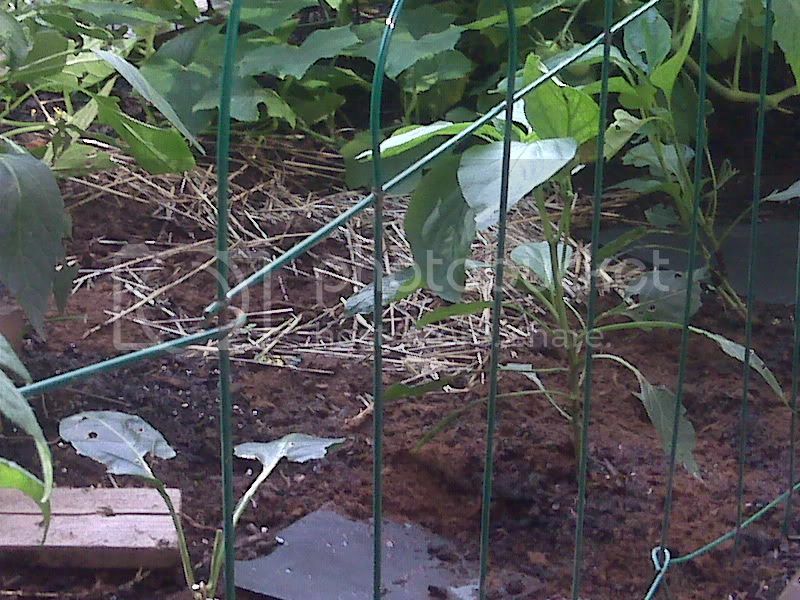 I replanted some cukes and yellow squash for fall, but they stuck their head out of the ground, looked at the temp. and promptly died. I guess it was a little early for them. It's nice to have someone on here in the Dallas area like me. When I mention how hot it is, you will know what I'm talking about. Thank you Ted. Your peppers look great too. They are so hard to grow. But they have surprised me in a good way. I'm getting a little feel for how it is to garden in very hot weather. We're having a heat wave. Four days so far of over 90 temps. You're probably laughing at this. I went out the first day and my tomato plants looked like they lost a foot in height. And keeping up with watering, well you already know.